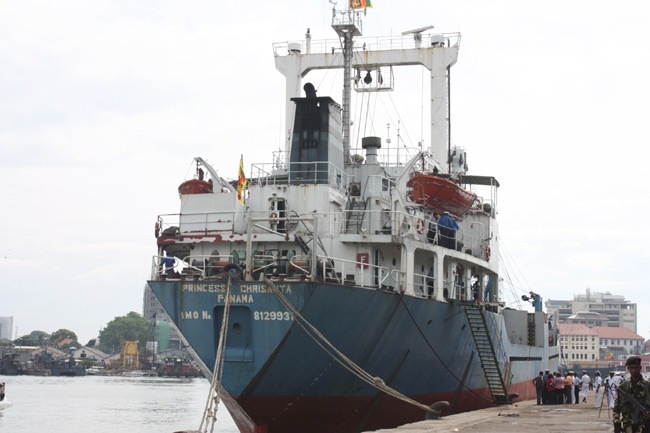 MV Princess Chrisanta, the vessel used by LTTE for arms smuggling and human trafficking was taken over by Sri Lanka three weeks back and was brought to Colombo Port by Sri Lanka Navy on December 21. The vessel was successfully brought from a foreign country to Colombo Port by Sri Lanka Navy Captain DKP Dassanayaka and his team. It is further reported that the vessel was seized on the basis of the information provided by LTTE chief arms procurer Kumaran Pathmanthan alias KP who is in the custody of the Sri Lankan authorities. It is believed that a light helicopter launched from this vessel could have involved in an attempt to evacuate LTTE leader Velupillai Prabhakaran before the army trapped him on the banks of the Nanthikadal lagoon in May 2009. The above photograph is from MOD Sri Lanka. Read and view more photographs from MOD Sri Lanka and Sri Lanka Navy.